Former Los Angeles Police Department officer Christopher Dorner -- the suspect in three killings that have targeted law enforcement and the subject of a continuing manhunt -- was suspected last week of fleeing to Mexico, according to a federal court document. The criminal complaint filed in federal court on Feb. 7 charges Dorner with fleeing to avoid prosecution. It states that there was reason to believe he had crossed the border into Mexico. An affidavit included in the complaint (pdf) was written by U.S. Marshals Service Inspector Craig McClusky the same day that the search for Dorner led to his burned out truck in the mountain resort of Big Bear. On day five of the manhunt for Christopher Dorner, who is suspected of killing three people, the Riverside District Attorney filed charges against Dorner including one count of first-degree murder and three counts of attempted murder. The LAPD has assigned officers to protect 50 families the accused cop killer has threatened, and a $1 million reward is now being offered for information leading to Dorner's arrest. NBC's Miguel Almager reports. McClusky recounted the Irvine Police Department's request for assistance from the U.S. Marshal Service in finding Dorner after he became a suspect in the Feb. 3 killing of Keith Lawrence and Monica Quan, who is the daughter of an LAPD official mentioned by Dorner is a manifesto that details his alleged revenge plot. McClusky described "the recent observations of a suspect matching Dorner's description attempting to flee to Mexico," and stated "there is probable cause to believe that Dorner has moved and traveled in interstate and foreign commerce from California to Mexico" to avoid prosecution. The document also states that U.S. Marshals were tracking a Dorner associate identified only as "J.Y.," who had been spotted in Costa Mesa, Calif., near Irvine. The search for Dorner continued in Big Bear on Monday, even as police followed multiple reports of sightings of the former officer that turned out to be false. 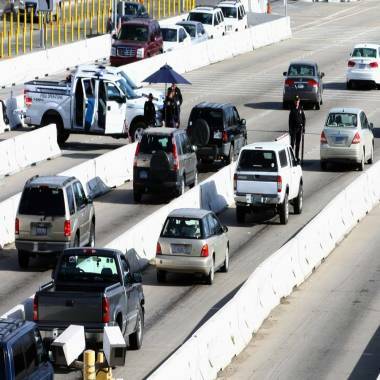 U.S. Customs and Border Protection officers check vehicles approaching the U.S.-Mexico border in San Ysidro on Saturday. Also on Monday, the Riverside County District Attorney's office filed a charge of murder against Dorner in the shooting death of Officer Michael Crain, who was killed in what authorities have described as an ambush. Crain was shot Thursday while he and his 27-year-old trainee partner were sitting at a traffic light near the Riverside Freeway. "We felt the state of the evidence dictated there was no reason to withhold filing charges," Riverside County District Attorney Paul Zellerbach said. "He's a felon at large." The LAPD on Sunday announced a $1 million reward in the case. More than 600 tips have been received, according to the department.